Which is the best catalyst for new system sales; latest-generation hardware; or an enticing piece of software? The answer is probably a combination of the two, and Chillblast is looking to play on both fronts with the newly-announced Fusion Vector base unit. Priced at £2,700 in full-blown Ultimate spec, this here machine claims to have been designed from the ground up for one of the year's most popular games, PlayerUnknown's Battlegrounds. 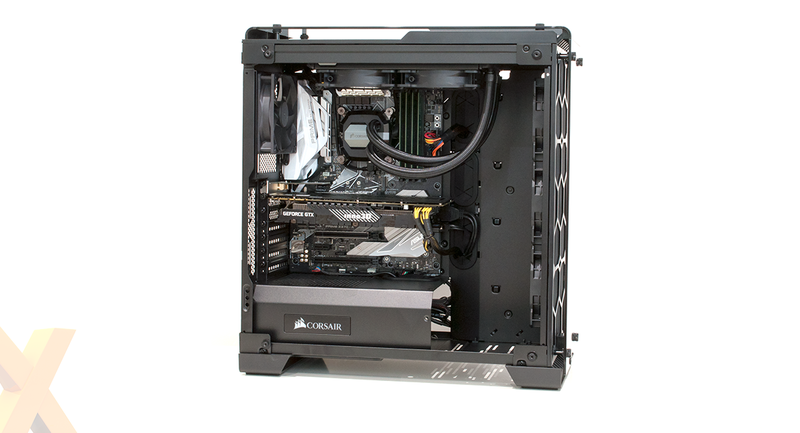 The proposition is quite simple; want to get in on the PUBG action with a premium rig boasting an array of modern hardware? Then you've come to the right place. What exactly constitutes a PUBG-ready machine? You could of course play the game on a PC costing far less, or even pick up an Xbox One for a couple of hundred quid, but the game is equally well known for being a whole lot of fun as well as poorly optimised. Version 1.0 has finally launched this week, after what felt like a never-ending beta, and though many players are known to lower quality settings to a minimum in order to achieve maximum framerate, gamers wanting to crank things up to 11 can invest in greater sheer horsepower. Those are the users that Chillblast is targeting and at this price point the headline components shouldn't come as a surprise. The CPU is Intel's new 12-thread Core i7-8700K, there's a generous 32GB of DDR4 memory and graphics come courtesy of a hard-hitting GeForce GTX 1080 Ti X2 from Inno3D. PUBG is the focus, but this collection of gear is well-suited to practically any game at a lofty 4K resolution, and it doubles as a potent entry-level workstation, too. 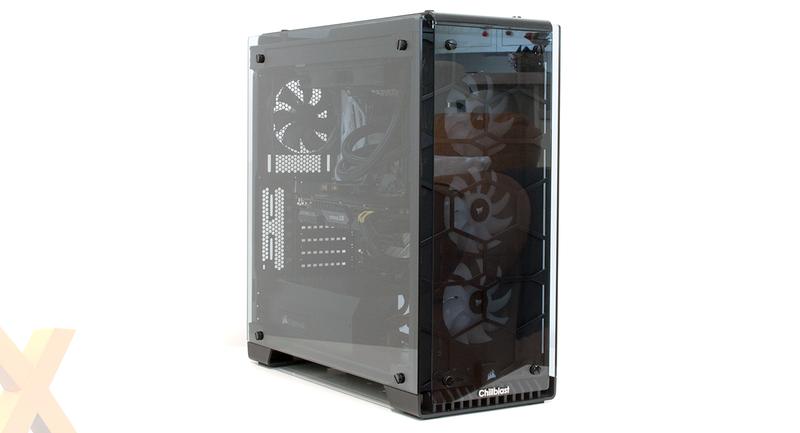 Dressed in an eye-catching Corsair Crystal Series 570X RGB chassis, the mid-tower rig turns heads through lots of tempered glass and plenty of multi-coloured illumination. It's a good-looking case, but as per our review from late 2016, the 570X lacks USB Type-C and does little to contain noise. 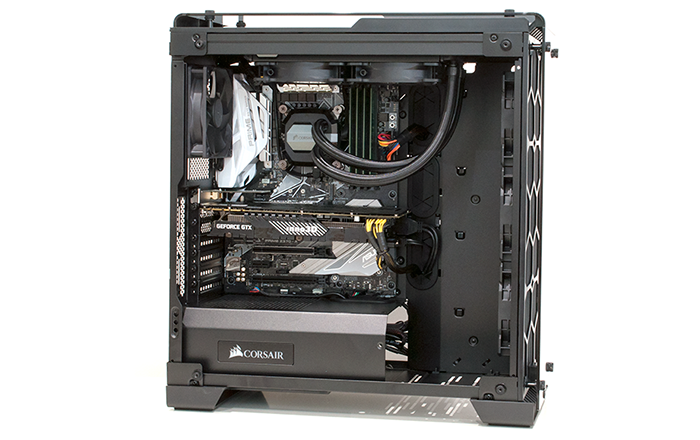 The Corsair brand nonetheless remains an attractive choice, but it's on the inside that this £2,700 base unit causes us to raise an eyebrow. The core hardware is sat atop a capable Asus Prime Z370-A motherboard, but we're surprised to find that the 32GB (4x8GB) of DDR4 memory is a basic kit from Crucial that lacks any heatspreaders and operates at a leisurely 2,400MHz. The memory is going to work just fine, and there's plenty of it, however at this price point we didn't expect to see green PCBs installed next to the Corsair Hydro Series H100i V2 liquid cooler. 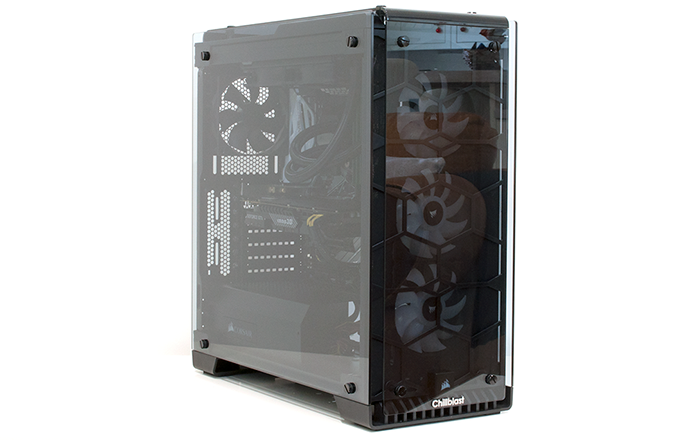 Detracting from what should be a premium feel throughout, the PSU is a modest Aerocool Integrator. Though the 700W capacity is ample, an entry-level 80 Plus White rating is out of place on a machine of this ilk, as are the non-modular cables. Rounding out the unexpected choices, the Core i7-8700K processor, an acclaimed overclocker, is shipped at default speeds, albeit with Asus Multicore Enhancement enabled in the BIOS. 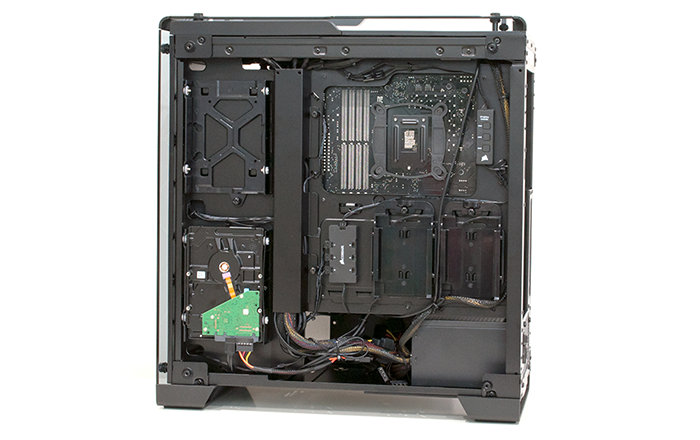 A few economical elements take away some of the system's wow-factor, though they are well-hidden - the 570X's tinted glass panels are such that the green memory sticks are barely noticeable. Elsewhere, Chillblast rounds off the specification with ample storage in the form of a 500GB Samsung 960 Evo M.2 SSD in addition to a spacious 4TB Seagate hard disk, and in order to cover all eventualities, an Asus PCE-N15 wireless adapter is installed for rudimentary WiFi duties. 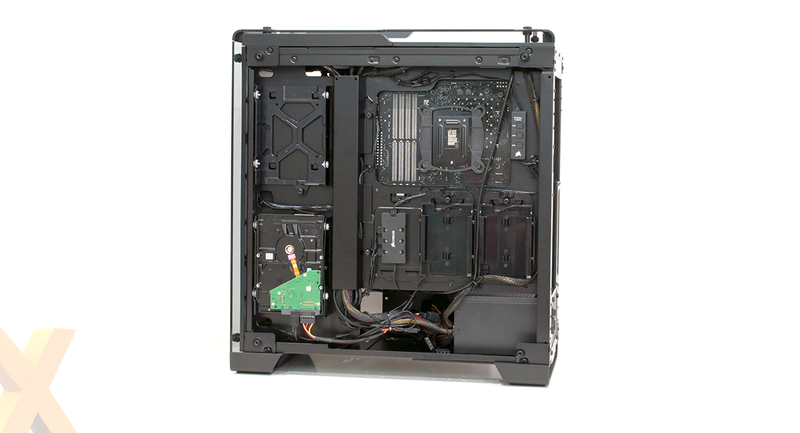 Chillblast's build is about as tidy as a non-modular PSU will allow, and there's zero bloatware on top of the 64-bit Windows 10 install. You might argue that the software configuration is a tad too clean, mind, as PlayerUnknown's Battlegrounds isn't included - Chillblast defends its decision to not bundle the game by stating: "given the massive amounts of players who currently own it, there is a high chance they already have it!" Peace of mind is crucial on a high-end base unit and Fusion Vector benefits from five-year warranty as standard. That includes collect-and-return for the first two years and labour for the duration, however there is a premium attached. Our back-of-the-paper calculations suggest that a knowledgeable user could source all of the aforementioned components and build a similar rig for roughly £2,200, making Chillblast's 20 per cent markup feel quite hefty. You do get a free £30 Nando's gift card while stocks last - the best PUBG players will understand the gesture - but rival system integrators have already demonstrated that this level of specification can be had for less.